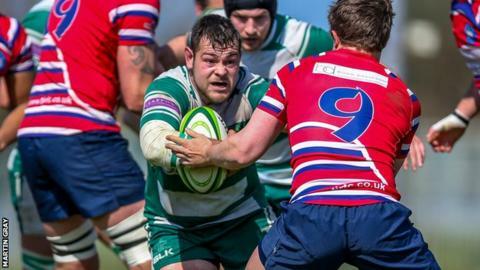 Guernsey boss Jordan Reynolds says he wants his side to take more risks in their final three games of the season. A 36-26 loss to Tonbridge Juddian ended any outside chance that the Raiders had of gaining promotion from National Three London. "We're a lot more relaxed with the pressure off and we want to be able to try things in these last few games. "We're upping our style of rugby at the moment and seeing what boundaries we can push," Reynolds told BBC Guernsey. Experienced lock Lewis Hiller returns to the island side for the visit of already-relegated Gravesend on Saturday, while Owen Thomas and Malcolm Barnes are also back in the squad. "We've had a chat about not counting down the minutes to the end of the season," added Reynolds. "We've got three games and we want to make sure that we're not just turning up for the sake of it, we want to be getting rewards at training and rewards out of the games as well."